This data set provides daily average observations for evapotranspiration (measured and gap-filled), precipitation, net radiation, soil water content, air temperature, vapor pressure deficit, and normalized vegetation index (NDVI) from two water-limited shrubland sites for years 2008-2010. Both sites are located in the northwest part of Mexico and are part of the MexFlux network. One site, El Mogor, is a Mediterranean climate shrubland (dominated by winter precipitation) located at the Valle de Guadalupe, Baja California, Mexico about 30-km from the Pacific Ocean. The second site, Rayon, is a subtropical shrubland (dominated by summer precipitation) at the edge of the Sierra Madre Occidental range, 4-km northeast of the town of Rayon in Sonora, Mexico. Each site was instrumented with an eddy-covariance tower and an array of meteorological and environmental sensors. There are two data files in comma-separated format (.csv) with this data set. Figure 1. El Mogor tower (left), Baja California, and Rayon tower (right), Sonora, both in northwestern Mexico. FLUXNET sites MX-Emg and MX-Ray, respectively. Investigators: S. Villarreal, R. Vargas, A. Yepez, S. Acosta, A. Castro, M. Escoto-Rodriguez, E. Lopez, J. Martinez-Osuna, J.C. Rodriguez, S.V. Smith, E.R. Vivoni, and C.J. Watts. This data set provides daily average observations for evapotranspiration (measured and gap-filled), precipitation, net radiation, soil water content, air temperature, vapor pressure deficit, and normalized vegetation index (NDVI) from two water-limited shrubland sites for years 2008-2010. Both sites are located in the northwest part of Mexico, and are part of the MexFlux network. Daily for the time period 2008-2010. There are two comma-separated (csv) data files with daily averaged data for the variables described below. The variables are the same in both files. Variable names generally follow AmeriFlux conventions. Data not provided or not applicable are recorded as -9999. This study represents the first collaborative effort toward syntheses studies across the MexFlux network (Vargas et al., 2012a, 2013b). Studies have recognized the importance of SWC for plant water uptake within the rooting zone and have modified the widely used Penman-Monteith equation to incorporate SWC to model ET in water-limited regions (Sun et al, 2013). This study supports these efforts by demonstrating that SWC is the main control of ET when available energy is not a limiting factor, but ET is controlled by an interaction of multiple variables when SWC is decoupled from available energy between water-limited ecosystems (Villarreal et al., 2016). Each MexFlux site was instrumented with an eddy-covariance tower and an array of meteorological sensors. Instrument calibration was performed on a monthly basis as part of quality assurance and quality control protocols (Foken and Wichura, 1996). Raw flux data were processed to half-hourly averages using the eddy covariance software EddyPro version 4 (LI-COR), which includes conventional corrections for calculating eddy covariance measurements (Burba, 2013). Statistical outliers for all micrometeorological measurements outside the ±3 SD range of a 14-day running mean window were removed. Periods with low turbulence conditions were excluded based on friction velocity (u*). We determined seasonal and site-dependent u*-thresholds according to quantitative methods (Gu et al., 2005). After u* quality filtering, which mostly occur at night, 62% of the data remained for the El Mogor site and 57% for the Rayon site (Villarreal et al., 2016). The El Mogor and Rayon study sites are flux tower sites. El Mogor (dominated by winter precipitation) is a shrubland located at the Valle de Guadalupe, Baja California, Mexico about 30-km from the Pacific Ocean, and it corresponds to the Diegan xeric Mediterranean shrubland association (Westman, 1983). This site has a Mediterranean climate with hot-dry summers and cool-wet winters. The mean annual temperature is 17 degrees C, and mean annual precipitation is 309 mm year-1, calculated between 1980 and 2009 from Daymet (Thornton et al., 1997; Thornton et al., 2015). Rainfall occurs during the cool-wet winters (November-April) with a range of monthly temperatures of 11-14 degrees C and monthly precipitation of 18-63 mm. The warm-dry months (May-October) have a range of monthly temperature of 16-21 ºC and monthly precipitation between 1 and 6 mm. This shrubland is characteristic of a mix chaparral with less-sclerophyllous plant species that are characteristic of the Mediterranean chaparral along the coast of California and Baja California. The species with the greatest ground cover at the study site are: Adenostoma fasiculatum, Ornithostaphylos oppositifolia, Cneoridium dumosum, Salvia apiana and Lothus scoparius. Soils are shallow (nearly 30-cm depth) and classified as a typical haploxersols developed from granitic parent material. Soil texture is sandy loam (Villarreal et al., 2016). Rayon (dominated by summer precipitation) is located at the edge of the Sierra Madre Occidental range, 4-km northeast of the town of Rayon in Sonora, Mexico. This site has a hot dry climate, with hot-wet summers and cool winters. The mean annual temperature is 21 degrees C and a mean annual precipitation is 487 mm year-1(Thornton et al., 2015). Most of the rainfall occurs between the months of July and September (60-70%); with a range of monthly temperatures of 27-30 degrees C and monthly precipitation of 60-125 mm. Meanwhile, the dry months (October-June) have a range of monthly temperatures of 12.5-30 degrees C and monthly precipitation between 5 and <50 mm. The species with the greatest ground cover at this subtropical shrubland are: Fouquieria macdougalii, Parkinsonia praecox, Acacia cochiacanta, Jatropha cordata and Encelia farinosa. The soil depth is ~70 cm, classified as Regosol-Yermosol, and soil texture is coarse sand (Villarreal et al., 2016). Each site was instrumented with an eddy-covariance tower and an array of meteorological sensors. The flux measurement system at the El Mogor site consisted of an open-path infrared gas analyzer (IRGA; LI-7500, LI-COR, Lincoln, USA) and a three-dimensional sonic anemometer (81000V, Young, Traverse City, USA) located at 3.5-m above the ground level. Flux measurements were recorded at 20 Hz, and data acquisition was performed by a box computer WaySmall 200ax (Gumstix, Redwood City, USA) during 2008, and subsequently replaced by a Gumstix Verdex on 2009, both computers run in a Linux operating system and an in-house software for data acquisition. Additional meteorological measurements included air temperature and relative humidity (HMP-45c, Vaisala, Helsinki, Finland), net radiation (Rn; NR Lite2, Kipp and Zonen, Delft, The Netherlands), photosynthetic photon flux density (PPFD, PAR Lite, Kipp & Zonen, Delft, The Netherlands), precipitation (TR-52USW, Texas Electronic, Dallas, TX, USA), barometric pressure (PTB110, Vaisala, Helsinki, Finland), soil heat flux at 8 cm depth (HFP01, Hukseflux, Delft, The Netherands), and volumetric soil water content (SWC) using time domain reflectometers at 5, 10, 20 and 40 cm depth (CS616-L, Campbell Scientific, Logan, USA). All meteorological measurements were recorded at a frequency of 1-min. Instrument calibration was performed on a monthly basis as part of quality assurance and quality control protocols (Foken and Wichura, 1996) (Villarreal et al., 2016). The Rayon site is instrumented with a 9-m height T45-tower supporting an eddy-covariance system and a suite of meteorological sensors. Flux measurements were carried at the top of the tower with an open-path infrared gas analyzer (IRGA, LI-7500, LI-COR), and a three dimensional sonic anemometer (CSAT 3, Campbell Scientific), measurements were recorded at 20 Hz. In addition an anemometer (R.M. Young Co., Traverse City, MI), a temperature-relative humidity probe (HMP45D, Vaisala), and net radiation (CNR-1, Kipp & Zonen, The Netherlands) sensor were mounted at a height of 7.5 m. A tipping bucket rain gauge (TR-52USW) was installed at 1.5-m height in an open area. Soil heat flux was measured using two soil plates at 3-cm depth (HFP01SC, Hukseflux). Soil moisture was measured at 5 and 10-cm depth with soil water content reflectometers (CS616-L). All sensors measured at 1-min and 30-min averages were stored (Villarreal et al., 2016). The additional 30-minute average data referred to here and in Villarreal et al. (2016), are being process for release in the future on the FLUXNET website (http://fluxnet.ornl.gov/). Raw flux data were processed to half-hourly averages using the eddy covariance software EddyPro version 4 (LI-COR), which includes conventional corrections for calculating eddy covariance measurements (Burba, 2013). Statistical outliers for all micrometeorological measurements outside the ±3 SD range of a 14-day running mean window were removed. Periods with low turbulence conditions were excluded based on friction velocity (u*). Seasonal and site-dependent u*-thresholds were determined according to quantitative methods (Gu et al., 2005). At the El Mogor site, this algorithm yielded u*=0.10 m s-1 for the three years analyzed, and for the Rayon site u* = 0.17 m s-1 for 2008, u*=0.16 m s-1 for 2009 and 0.16 m s-1 for 2010. After u* quality filtering, which mostly occurs at night, 62% of the data remained for El Mogor and 57% for Rayon. Storage fluxes were not calculated because the study sties have short canopies and are well mixed with the overlying atmosphere. The storage flux was assumed to be zero for a 24-hour period (Villarreal et al., 2016). Using filtered data, the energy balance closure was calculated as an independent measure to evaluate the performance of eddy covariance measurements following standardize guidelines (Wilson et al., 2002). Ground heat flux was derived from 3 soil heat flux plates at the El Mogor site and from two soil heat flux plates at the Rayon site. The energy balance closure was only calculated for the periods when data for all components (LE, H, G, and Rn) were available. Energy balance closure was evaluated for each site using the energy balance ratio defined as the cumulative sums of turbulent fluxes (LE + H) divided by the available energy (Rn - G). Energy balance closure for the El Mogor site was 0.82 and for the Rayon site was 0.89 for the years 2008 to 2010 (Villarreal et al., 2016). These reports are in accordance with FLUXNET open and closed shrublands that have a mean of 0.87 ± 0.15 (Stoy et al., 2013). For all data analyses, filtered data were used (i.e., data with gaps), but for comparing annual sums and performing time series analyses we used gap-filled time series. Data gaps were filled following the procedures by the online Eddy Covariance Gap-Filling and Flux-Partitioning Tool available at: http://www.bgc-jena.mpg.de/~MDIwork/eddyproc/ (Reichstein et al., 2005). Burba, G. (2013), Eddy covariance method for scientific, industriral, agricultural and regulatory applications: A field book on measuring ecoystem gas exchange and areal emission rates. Li-Cor Bioscience. Foken, T., and B. Wichura (1996), Tools for quality assessment of surface-based flux measurements, Agric. For. Meteorol., 78(1-2), 83-105, doi:10.1016/0168-1923(95)02248-1. Gu, L. et al. (2005), Objective threshold determination for nighttime eddy flux filtering, Agric. For. Meteorol., 128, 179-197, doi:10.1016/j.agrformet.2004.11.006. Leon, E., R. Vargas, S. Bullock, E. Lopez, A. R. Panosso, and N. La Scala (2014), Hot spots, hot moments, and spatio-temporal controls on soil CO2 efflux in a water-limited ecosystem, Soil Biol. Biochem., 77, 12-21, doi:10.1016/j.soilbio.2014.05.029. Reichstein, M. et al. (2005), On the separation of net ecosystem exchange into assimilation and ecosystem respiration: Review and improved algorithm, Glob. Chang. Biol., 11, 1424–1439, doi:10.1111/j.1365-2486.2005.001002.x. Sun L., Liang S.L., Yuan W.P., and Z. X. Chen (2013). Improving a Penman-Monteith evapotranspiration model by incorporating soil moisture control on soil evaporation in semiarid areas. Int J Digit Earth, 6, 134-156. Vargas, R. et al. (2013a), Drought Influences the Accuracy of Simulated Ecosystem Fluxes: A Model-Data Meta-analysis for Mediterranean Oak Woodlands, Ecosystems, 16, 749-764, doi:10.1007/s10021-013-9648-1. Vargas, R. et al. 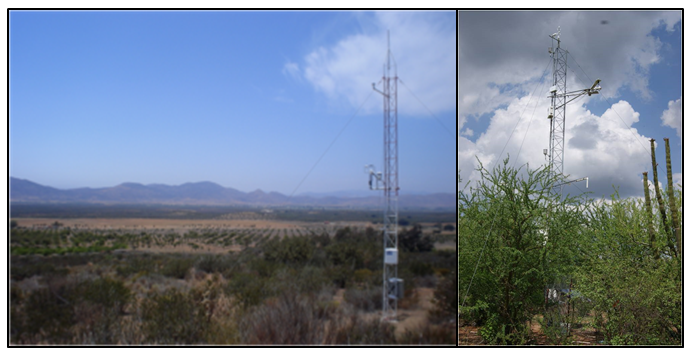 (2013b), Progress and opportunities for monitoring greenhouse gases fluxes in Mexican ecosystems: The MexFlux network, Atmosfera, 26(3), 325-336. Vargas, R., H. W. Loescher, T. Arredondo, E. Huber-Sannwald, R. Lara-Lara, and E. a. Yépez (2012a), Opportunities for advancing carbon cycle science in Mexico: Toward a continental scale understanding, Environ. Sci. Policy, 21, 84–93, doi:10.1016/j.envsci.2012.04.003. Vargas, R., S. L. Collins, M. L. Thomey, J. E. Johnson, R. F. Brown, D. O. Natvig, and M. T. Friggens (2012b), Precipitation variability and fire influence the temporal dynamics of soil CO 2 efflux in an arid grassland, Glob. Chang. Biol., 18(4), 1401-1411, doi:10.1111/j.1365-2486.2011.02628.x. Villarreal, S., et al. (2016), Contrasting precipitation seasonality influences transpiration dynamics in water-limited shrublands, J. Geophys. Res. Biogeosci., 121, doi:10.1002/2015JG003169. Weiss, J. L., D. S. Gutzler, J. E. Allred Coonrod, and C. N. Dahm (2004), Seasonal and inter-annual relationships between vegetation and climate in central New Mexico, USA, J. Arid Environ., 57(4), 507–534, doi:10.1016/S0140-1963(03)00113-7. Westman, W. E. (1983), Xeric Mediterranean-type shrubland associations of Alta and Baja California and the community/continuum debate*, Vegetatio, 52(1), 3–19.